You’ll have to excuse the blurred image, you see my hands were shaking while I was taking the photo. These new fragrances by Thierry Mugler won’t be announced to the media until tomorrow and aren’t really available to the public until Thursday, April 24th. I snapped the photo while nobody was looking. 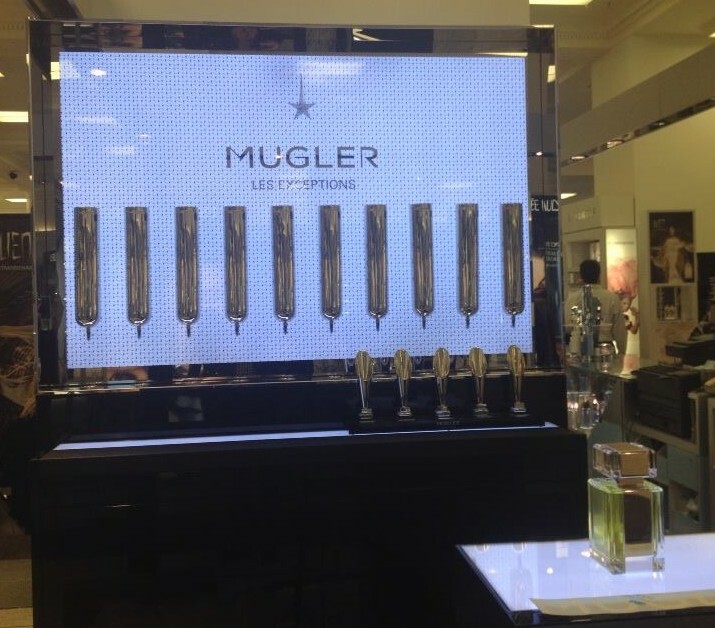 Why Mugler chose Montreal, Toronto and Vancouver to launch a new series of perfumes is beyond me but there you have it. According to the Mugler Sales Associate, the world launch is happening right here in Canada. There are five new fragrances available initially and five more on the way. The SA was very careful about what she was telling me because it’s all so new but the noses behind the first five fragrances are Olivier Polge (before his announcement to join Chanel) and Jean-Christophe Hérault… alongside consultation with Mr. Mugler. The names of the fragrances are Oriental Express, Chyprissime, Fougère Furieuse, Supra Floral and Over the Musk. 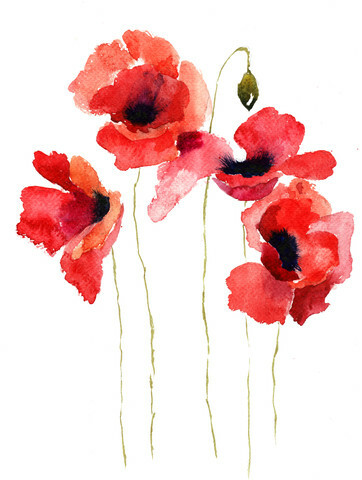 From an initial test on paper, the one that impressed me the most was Supra Floral, a Chamade-like green, spring floral. It lasted on my skin for several hours and I thought it was lovely. I’d rather not talk about the other fragrances until I’ve tested them on my skin but I thought on paper they certainly warranted a skin test. Refillable bottles of 80 mls. go for $185 Canadian dollars. The refill will cost you $127 per bottle. When these will launched to the worldwide public, I have no idea. When I find out more, I’ll let you know. C’est ou ce lancement? Est ce que ca sera la plusieurs jours? Y a t il un pour homme dans cette liste? Le lancement est à La Baie au centre-ville de Montréal. Selon la représentante, les parfums sont tous unisexes. On le voit aussi par la bouteille plutôt neutre. Mais tu connais mon opinion sur ce sujet. Les amateurs de parfum portent ce qu’ils veulent. Remember that old Red Rose tea ad: “Only in Canada, you say? Pity…” 😀 Well, I don’t think it’s a pity to be first with a new perfume only in Canada. They ought to début perfumes here more often! Mugler is one company with a very comprehensive counter here in Montreal and I applaud them for treating Canadians like the world-class perfumistas we aim to be! I KNEW that someone in Canada was going to bring up that series of commercials… hahahah! I almost typed it in myself! Thanks for the comment! I had a fun time researching the following accompanying video. I wonder why Montreal? Is it because they see the Montreal client as a cross between the European and American markets? Let me know what you think? I’ve got to verify the noses… I believe it was an olfactory collaboration. I am finally glad to see I can speak of these fragrances. They are the exquisite editions to Mugler. Like a couture piece of fashion, they will meld to your form. The art behind the fragrances is meant to go back to the refined taste of perfume, where they play with the basic olfactory and mix it with a guest ingredient that is not associated with the olfactiove families. They are wearable by anyone. Once you sit down and get the full experience of the fragrances, you’ll have difficulty choosing which is your favorite. To answer the question of who the nose is, there was no collaboration (besides Mr. Mugler himself); the nose behind the fragrances is Olivier Polge. Why Canada? It may not be the largest fragrance market, but it’s the most loyal when it comes to Mugler and Canadians are huge fans of the house. They get the premiere launch and then the fragrances will be distributed to ten other international locations. The Toronto press release will be this Friday and thus officially launching at the next door. Thank you very much for the backstory! Such a mystery! And I corrected my post regarding the nose. Can’t wait to try them fully! My bad, I’m very excited about the line and forgot that there was two perfumers. A little embarrassing, but I’m only human. I met the other gentleman today. The other perfumer is Jean-Christophe Herault. Jean-Christophe created two and Olivier Polge created three, along side consultation with Mr. Mugler. OK.. I’ll fix the post. Thanks for the correction. The musk and the oriental were my favourites. They sold out of the musk the first day of sales! Fred loved the Oriental Express on me so I went back and bought it. My work colleague got the last bottle of the musk for his fiancée. I want to go back and smell them again at some point as the Mugler counter was mobbed on launch day, huge line, just incredible. Really! I’ve never heard of such a thing. I’ve got to go back myself.